Chennai Super Kings (CSK) played Kolkata Knight Riders (KKR) in the match no 29 of VIVO Indian Premier League (IPL), 2019. CSK defeated KKR at Eden Garden by 5 wickets as they chased down the total of 161. 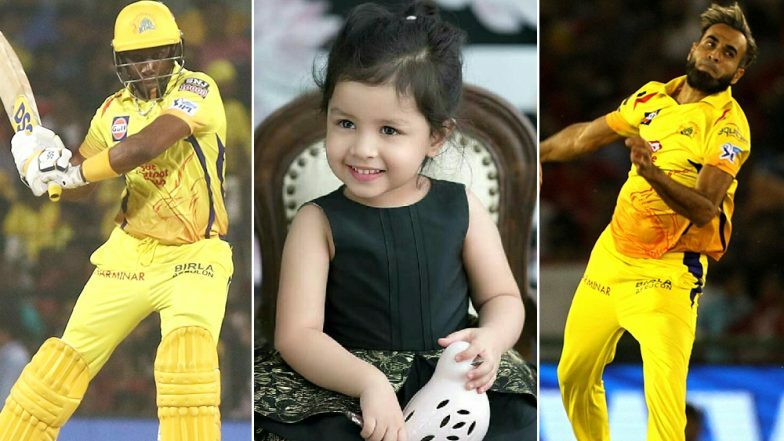 Post KKR vs CSK match IPL 2019, skipper MS Dhoni's daughter Ziva Dhoni was seen playing with Chennai's player Dwayne Bravo and Imran Tahir. KKR vs CSK, IPL 2019 Highlights: Chennai Super Kings Beat Kolkata Knight Riders by Five Wickets. Ziva Dhoni is mostly present in all CSK matches to cheer for her father's team CSK. Ziva seems to have good bonding with CSK players as run around and plays with them on the ground after the match get over. MS Dhoni Says ‘Inshallah’ to Which Ziva Replies ‘Mashallah’! Watch Father-Daughter Duo’s Adorable Video. Dwayne Bravo has been missing last few games in IPL 2019 due to a hamstring injury. While on the other hand, CSK spinner Imran Tahir is on a roll, as he ran through the KKR batting line up to dismiss key KKR batsmen like Chris Lynn and Andre Russell. Tahir had a figure of 4/27 in four overs in Chennai's last game against Kolkata Knight Riders. CSK side with 14 points currently is doing well in IPL with a well-balanced side. However, they will want Bravo to recover soon and make a comeback soon to make their side more strong. Chennai will play their next game against Sunrisers Hyderabad on Wednesday, April 17, 2019, in the match no 33 of IPL 2019 at Rajiv Gandhi International Stadium, Hyderabad.